"What's the name of this place?" This section of The Unmutual deals with the locations seen in The Prisoner which are not in Portmeirion. If you wish to view pictures of Portmeirion, we have a separate Portmeirion Gallery with over 170 photographs. Those who wish to learn specifically about the use of Portmeirion in The Prisoner are advised to purchase Cathy Frumerman's Book "On the Trail of the Prisoner", available from PrizBiz. A review of the book can be found in our reviews section. The Series was mostly filmed in Portmeirion, and at the MGM Studio and Backlot in Borehamwood. However, there are still several episodes, and of course the Series' opening sequence, which feature other locations. With 50+ locations and 150+ photographs, this guide is by far the most comprehensive Prisoner Locations Guide ever compiled and, as such, some information (or images) may be missing. If you can help, please contact us. The Locations in the following guide (written in episode/scene order) are underlined and are clickable links which take you to a further page of photos and detailed information of the location (the images on this page are also clickable links to the individual page dedicated to the location). Many of the locations in this guide are visited as part of Dave Lally's twice-yearly Locations Walkabouts, details of which can be found on the events page. A clap of thunder, and The Prisoner begins with Number Six driving his Lotus down a deserted Runway - Podington raceway in Northamptonshire. The car is then briefly seen driving over Westminster Bridge, before driving past the Houses of Parliament. The car then takes a right turn off of Abingdon Street before taking another right turn into Abingdon Street Car Park. The next few locations are located underneath Marble Arch and Park Lane, where the car stops to take a ticket from the car park ticket machine at the Cumberland Gate entrance, drives along the left wall before stopping in front of a set of double doors, which are then pushed open. McGoohan is then seen striding up a corridor. After resigning, McGoohan drives back out of Abingdon Street Car Park. He then overtakes a Hearse in Bayswater Road (a Triumph car is seen turning right out of Clarendon Place) before the scene then shifts to Park Lane, where the hearse is seen behind the Lotus. The Lotus then drives in front of Buckingham Palace. McGoohan is then seen pulling up in Buckingham Place, outside his home (No 1). After being gassed, his last view of London is the Stag Place Flats. A double for Nadia is seen swimming in the sea. This was filmed in at The Warren in Folkestone, and again dring their sea escape, Number Six and Nadia are seen jumping from their raft near Folkestone Harbour. A short while later, there are shots of a truck driving through the countryside (location unknown). All other sequences in this episode were filmed at MGM, Portmeirion or make use of stock footage (supplied by "World Backgrounds"). The scenes on the raft were filmed 30-miles into the Irish Sea. The exterior gunrunners' boat sequences were filmed off the coast of Abersoch, in North Wales. When Number Six comes round after being washed up on the shore, he climbs the cliff to reveal that he is at Beachy Head. He then has a meeting with some Romanys, filmed in the Folkestone area, before spotting a roadblock and jumps in a truck (locations unknown). When he jumps out of the truck, he is in fact at the north end of Park Lane where Marble Arch can clearly be seen in the background. The next scene is at the Wellington Memorial, in Duke of Wellington Place, when he hears the words "hold it". The next scene shows him crossing Stag Place before arriving outside his home in Buckingham Place. He walks round the corner and looks down Palace Street before Mrs Butterworth arrives to divert his attention. After leaving Buckingham Place, he is seen driving down a street (Elstree Way) before entering Abingdon Street Car Park. Later in the episode, there is a short sequence of a Policeman back at the Romany location (location unknown). The airfield featured near the end of the episode is Chalgrove Airfield, Oxfordshire. The exterior shots of MS Polotska towards the end of the Episode, were shot at Abersoch off the coast of North Wales. After waking up in his home and speaking with Janet, Number Six drives out of Buckingham Place, and then drives past the Houses of Parliament. There are then some edited shots (taken from the opening sequence) in the corridor. The following scenes in the moving Paternoster lift and corridors are at the GEC-Marconi building in Elstree Way, Borehamwood. After his meeting with Sir Charles, Number Six drives out of Abingdon Street Car Park, in front of Buckingham Palace, briefly in traffic on Bayswater Road, down Park Lane (followed by a Hearse) and into Achilles Way, before stopping outside his home in Buckingham Place. A later scene sees him entering World Cameras, in Shaftesbury Row in Holborn. He is then seen briefly in front of Buckingham Palace, before turning off of Catherine Place and back into Buckingham Place again. There then follow scenes of Potter following Number Six to Dover (which is represented by stock footage). The journey takes them via the A1 at Borehamwood (doubling for the A20) , and the A41 roundabout at Elstree. Some of the shots representing Kandersfeld were of Seefeld in Austria, but were stock/library footage. The early sequences in this episode (and some later sequences such as the escape/lasooing) were filmed at the North end of the B4541 at Five Knolls on Dunstable Downs in Bedfordshire. The Lynching tree in Harmony no longer exists, but the site is Rutherford Close in Borehamwood. The opening cricket scenes in this episode were actually filmed at three separate locations. The establishing shots were filmed at Bearsted in Kent, with the Potter and close up sequence filming at Eltisley Cricket Ground near St Neots in Cambridgeshire. More establishing shots were filmed at Meopham Cricket Ground in Kent. The next three sequences were filmed in Shenley Road, Borehamwood. On the way to meet Potter, Number Six briefly passes the Barclays Bank. His meeting with Potter takes place outside the Velda Shop (with Death standing in the window), with the ABPC Studio building visible in the background, before visiting the Magnum Record Shop. There then follow more scenes at the above-mentioned cricket grounds before Number Six arrives for a drink at his local pub, The Thatched Barn (Elstree Moat House) in Borehamwood. The fairground sequences seen in this episode were filmed at two separate locations. The Kursaal funfair at Southend, Essex, and Battersea Funfair (with stock footage of Montreal's 1967 EXPO). Number Six and Death then embark on a location-rich car chase. The opening location of the car chase, once they leave the funfair, is what was formerly the A6(T) (incorporated into the M25) at Shenley. They are then seen driving past The White Hart on the junction of Blanche Lane and St Albans Road. The action then returns to what was the A6(T) where they travel under the now demolished A111 Junction bridge heading towards South Mimms. They are then seen turning left into Rectory Lane. They then briefly pass Well End Lodge during the "spinning car" sequence in Well End Lane, Well End. Death then turns round in the Mops and Brooms car park in Well End, forcing Number Six to double back up Rowley Lane. They then turn off down Buckettsland Lane from Well End Lane (signposted Witchwood). The last location in the chase, before the Witchwood sequences, shows both cars speeding past the Harris Lane/Rectory Lane/Mimms Lane Junction in Shenley. 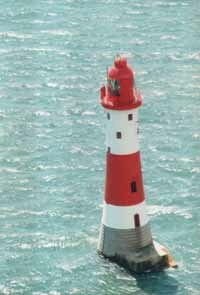 The exterior lighthouse sequences which follow were shot at Beachy Head. The tunnel in which the escapees smash through the gates and escape, is Mayfield Tunnel near Crowborough in East Sussex. A brief shot then appears of the truck driving down a country lane, which in reality is Silver Hill, London N21. The truck is then seen driving past a businessman before dropping off Number 48. This sequence was shot on the A1 at Borehamwood (doubling for the A20). The truck is then seen driving round Trafalgar Square, before being pulled over by a police motorcycle on the Victoria Embankment. Leo McKern is then seen entering a Parliament Rear Door at Old Palace Yard, at which point Number Six enters into a conversation with a policeman by a postbox opposite. Number Six and The Butler then run for the bus on Westminster Bridge. Number 48 is then seen hitching for a ride back on the A1 (doubling for the A20) before Number Six and The Butler arrive at Buckingham Place. Number Six is then shown in his Lotus driving past the Houses of Parliament. Leo McKern is then again seen entering (in smarter clothes) the door at Old Palace Yard again before one final shot of McGoohan in his Lotus on the runway at Poddington. All other sequences in this episode were filmed at MGM, Portmeirion, or make use of stock footage (supplied by "World Backgrounds"). Much of the inspiration for The Village came from Inverlair Lodge, in Scotland. After each day's location filming at Portmeirion, the shot footage was viewed by the crew at the Coliseum cinema in Portmadoc. Locations for Danger Man, including the Prisoneresque episode "Colony 3" can be seen HERE. If you can help with any further images or details regarding any Prisoner locations, please do not hesitate to contact us. The Unmutual Prisoner Locations Guide was devised, written, and compiled by Rick Davy, with additional location reports by David Healey. Additional thanks to Anthony McKay, Kieran McAleer and the member sof the MGM Borehamwood Memories Facebook Group, Geoff Dodd, Paul Smith, Robert Monks, Francesca De Florio, Robert Truman, Al Samujh, MJ Goldthorpe, Nick Laister, Louise Carter, Steve Dix, Gareth Thomas, Helen Weathers, Philip Lamdin, and Frank Shailes for the additional information. All photos featured in this section of The Unmutual may not be reproduced without prior permission in writing. Photographs by Rick Davy, Geoff Dodd, Kieran McAleer, Mike Grant, Richard James G, Paul Smith, David Healey, Helen Weathers, Nigel Kitcher, Simon Wells, Asa Forsvall, Stuart Townsend, Jeff Morgan, Darren Stokes, Tim Haynes, and Martin-Baker Ltd.